Fill out your Loon Ratings for the 1-0 Carolina Home win! Voting Closes Saturday at Noon Central! Someone described this game as the worst he had ever seen a team win 3-0, which was definitely reflected in the ratings. I was busy hanging out with my one day old son, who I am taking to call the “Tiger Woods of Soccer”, so I wasn’t too focused on the game. I’ll have to take the fans word on this one. Ibarra had a great game, with an amazing goal, and was given free rein to find space all over the field. Definitely a deserved Player of the Match. Mitch Hildebrandt worked hard in the back, sometimes harder than he needed, to keep the clean sheet and was rated highly by the fans for that. Does Minnesota have a goalkeeper controversy? Question: Where Will Minnesota Finish in the Fall? Most people said 1st place for the Fall finish. The lowest anyone said was 3rd. That’s some confidence in you from the fans, Minnesota United! It’s been a long mid-season break, but July 4th saw the Minnesota United FC play the Mexico U-21 National Team in a friendly. At times it was less than friendly, what with 3 red cards given for a confrontation in the second half. The team played with some new tactics and gave us a peek at what Manny Lagos might try once the season kicks off again this weekend in Ft. Lauderdale. Miguel Ibarra picked up another player of the match, with his high work rate and his new position as a forward. My favorite highlight of the night was his rainbow pass to Ramirez. With him pushing forward allows more room for other midfielders to find space in the midfield. The last two games have seen Lagos experimenting a lot with positions and formations. Will he go back to the 4-2-3-1 of the Spring Season or continue with the experimentation? Kevin Venegas had a great game, although in one sense to call him a defender is a misnomer, as he spent much of the game pushing far forward along the sideline. If Minnesota had heat maps for their players the darkest portion for Venegas would be right along the halfline. The new formation of 4-3-3 gives a lot of space for Venegas to make overlapping runs. Hildebrandt was rated really highly by the fans this week, but we still saw his struggles with goal kicks and passing. If he could improve on this area of his game, he would definitely find himself starting somewhere in NASL, if not here in Minnesota. Ft. Lauderdale away this Saturday. Game time is 6:30 local time. What a tough loss. Minnesota lost a game they could have won, but those of us who watched it could be very proud of how the Loons performed. Mitch Hildebrandt was the clear player of the match. He kept the team in the game when they went down to 10 men and Sporting KC smelled blood in the water. A great game by him. Venegas got a lot of love coming back from his broken jaw and performing well both in his overlapping runs and in his defensive acumen. It’ll be great to see Minnesota back to near full strength (no Campos) this fall. Jamie Watson got the nod for Sub of the Match, but I have to disagree. He was directly responsible for the second goal. Granted, he was put into a position at left back that isn’t his usual spot, but still, he probably wasn’t the best sub for the game. The completely impartial fans of Minnesota United FC said no, it should have received a yellow. 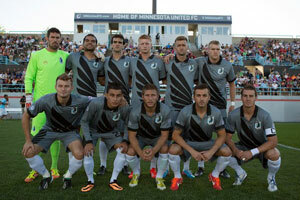 The next match for Minnesota United is July 4th. 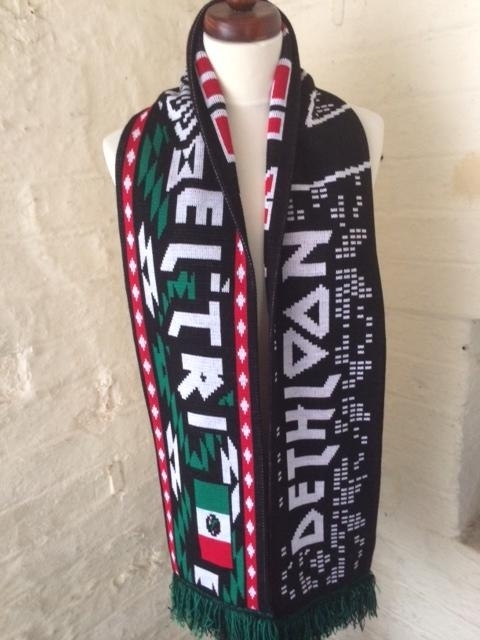 Have you seen the scarves the Dark Clouds will have for the match? Check out the detailed numbers below!